I always love a book that I pick up planning to only read a few chapters and i get immersed in it. 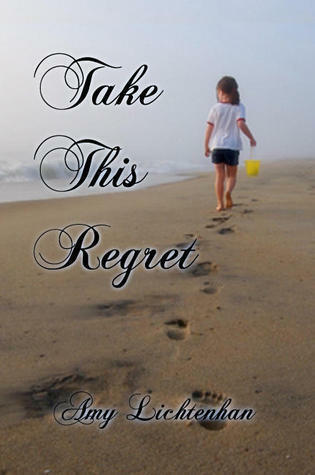 That to me is a great way to spend a night and what happened when I started Take This Regret. I w as immediately sucked into the story of Elizabeth and Christian. Unfortunately, I had to put it down otherwise I would have stayed up all night reading and that would have been bad juju for work the next day. As a reader, I’m normally not a fan of the separation/reunion type romances, which is what this primarily is, and yet, I was sucked in. I don’t know why I normally have such as issue with them – maybe because in the way the scenario is typically presented – I don’t know if in the same situation I would have forgiven the idiot who caused the grief. And to some extent I felt the same here – if I was in Elizabeth’s shoes would I have been able to forgive Christian for what he did…probably not – and yet, the author made me believe in second chances and the fact that sometimes people do regret the actions the result in other people getting hurt. I did like the fact that the whole book didn’t occur in a really short space of time, which to me would have made it more unbelievable than normal – but rather over a period of several months and you saw the struggle that Elizabeth faced as she tried to make the decision to let Christian back into her and her daughter’s life. The one thing that I felt could have been avoided in the story was the meeting his child for the first time at the grocery store – that just seemed a bit trite and overdone. I wish instead that it had been a proactive approach by Christian to find out what happened to Elizabeth and his daughter all those years ago and not just left to chance.